Most anglers who have the hobby, or maybe more truthfully the addiction of fishing have employed the use of a fish finder or are seriously considering purchasing one. From our own experience, a reliable sonar fish finder can turn the tide in your favor when chasing your fish species of choice. In this review, we are going to take a look at one of Humminbird’s new line of portable and versatile fish finders, the Fishin’ Buddy Max DI. We think the ease of use and mounting versatility, along with the down imaging and dual beam frequency, this is an excellent choice for those looking to break into the fish finder scene and especially for those looking for a fish finder for smaller, single seat watercraft. From the Fishing Tech perspective, we give the Humminbird Fishin’ Buddy Max DI an overall B rating. The Humminbird Fishin' Buddy was designed for minimal assembly and wiring. The head control fits onto a body that is comprised of a head mount, C-clamp, telescopic rod (24-40 inches), and built-in transducer. The down imaging technology sets it apart from the Fishin' Buddy Max model. Down Imaging sonar gives you clear image of bottom structures from the fish’s point of view with a 455kHz, 74 degree thin beam that gives you a wide area of coverage. The DI technology has a max depth of 320ft making it usable for just about any inshore and even offshore fishing. Humminbird’s Dual Beam technology is not the newest or sexiest innovation in the field, but you can't deny its usefulness. The Dual Beam refers to the two separate frequency cones emitted by the transducer. The narrow 16 degree beam (455kHz) gives excellent detail of bottom structure while the wider, 28 degree beam (200kHz) is much better suited at finding fish in the area surrounding the boat. Also, the Dual Beam frequency has a max depth of 600ft. The Fishin’ Buddy Max DI features several alarm features programmable for fish identification (3 sizes) as well as subsurface structures. Alarm settings can also be programmed for battery life and depth settings. Other features can be controlled easily through the control head including switching between 10 sensitivity settings of the sonar, zoom features, chart scrolling speed, and adjustment of the high and low end of the depth range. There are several accessory and replacement products that can be purchased separately from the actual fish finder. Float tube strap for smaller water vessels making attachment much easier. A unit cover is also available for purchase separately from the product. The simple setup and portability are two of the main reasons why we like the Humminbird Fishin' Buddy.. While it is more popular for smaller, personal watercraft, it can easily be mounted to larger vessels securely with its versatile C-clamp. The telescopic rod makes it manageable for smaller watercraft and usable for larger vessels with a max 40” extension to get it down into the water. The built-in transducer cuts down on assembly and mounting frustrations and gives off a decent signal for this type of sonar fish finder given the depths achievable and the target differentiation. The control head sits on a swivel mount that is easy to maneuver with one hand but not loose enough to swivel out of place. We have come across Enough complaints from various retail stores such as Amazon and Cabela’s about the control head being unstable at anything above trolling speeds for us to have to address the problem.This has been an issue on these models for some time. The water pressure on the rod and transducer tends to knock the control head off of its mount at only trolling speeds. This product does not feature any navigational system nor is it GPS compatible. It's designed strictly to find fish, and it does that incredibly well. Target separation is very fine for the affordability of this product at 2 ½". With the light settings and crisp 240H x 320V resolution, the Fishin’ Buddy Max is easy to read at any time of the day and at night. Humminbird’s Dual Beam technology is not the newest or sexiest innovation in the field, but you can't deny its usefulness. The Selective Fish ID gives, makes distinguishing between medium, medium/large, and large fish is a nice benefit for those not used to reading and interpreting the raw sonar returns. There are several functions that can be tinkered with to give you more distinct bottom definition including the WhiteLine display which highlights the strongest signal return. As we have mentioned previously, the inability to run both frequencies simultaneously is an unfortunate drawback, but you can quickly navigate between the 200 and 455kHz frequencies to monitor bottom structure in more detail or get a broader coverage with less sensitivity. The Down Imaging system on the Fishin’ Buddy Max DI gives you a different look into the world of fish and provides you with a real image of the bottom structure and allows you to differentiate between sunken logs, brush, boulders, or other bottom structures. Like the dual beam, you can dial in the down imaging to specific depth criteria with ease and with a max depth of 300ft, there are not going to be many, if any, situations where down imaging is going to be ineffective. For actually spotting fish with this function, it becomes a little muddled. Clouds or white streaks can be interpreted as suspended fish, but there is also the chance of it just being vegetation. Maybe the most important aspect of a fish finder is that it is easy to use on the water. While a fish finder can be an invaluable tool, most anglers want it to run itself and allow you to focus more on the actual fishing aspect. The menu of the Fishin' Buddy Max ID is incredibly easy to navigate, and in a few minutes, you can have it programmed to your needs. This includes quick adjustments to the contrast and sensitivity of the sonar as well as switching between the different frequencies available (). The Humminbird Fishin’ Buddy Max DI is unique in the Humminbird line of fish finders, and any line of fish finders, with its unique mounting and built-in transducer. It is on the lower end of the spectrum when it comes to sonar technology, given that Humminbird has some of the most advanced personal sonar equipment on the market. Still, it is a unique piece of equipment and fills a niche in the fishing world. The Lowrance HOOK-4x offers both CHIRP Sonar as well as down imaging. CHIRP sonar emits a range of frequencies within its range rather than having to switch between frequencies as with the Fishin’ Buddy Max DI which gives a much sharper picture of structures. 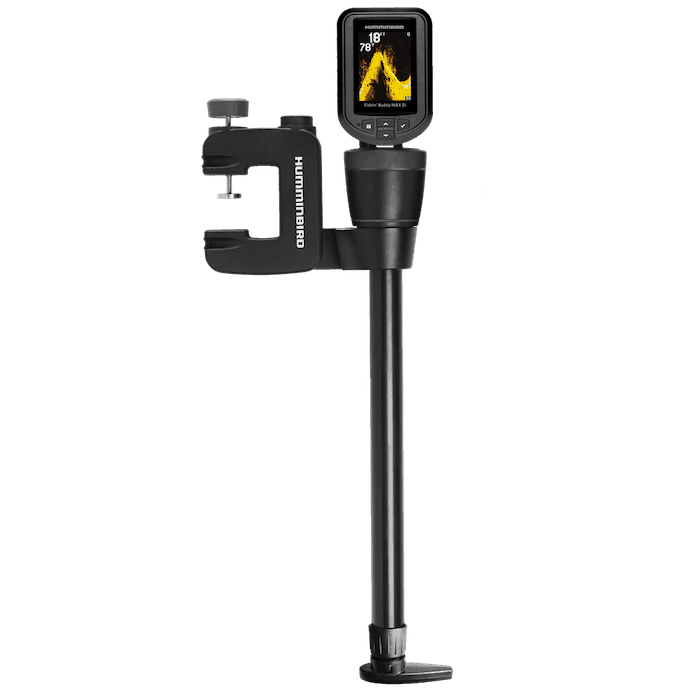 This product also has DI capabilities and also has the function of overlaying the DI with the CHIRP sonar information. This rangefinder takes a little more getting used to regarding scrolling through its menu and all of the functions than the Fishin' Buddy MAX DI, and it does not have the versatility regarding portability and mounting options. The Raymarine Dragonfly 4PRO falls in the same size and price range as the Fishin' Buddy Max DI. Where the Dragonfly 4PRO differs is that it uses CHIRP sonar to emit a wide range of frequencies at once. This product also allows overlay of the traditional sonar with down imaging and features wi-fi, sonar chart construction, and the option for map databases, all missing from the Fishin’ Buddy Max DI. Compared to other high-end fish finders, the Humminbird Fishin’ Buddy might be lacking in some aspects, but comparison is the thief of joy. If you’re looking for an affordable, portable fish finder that you can slap on anywhere, the Fishin’ Buddy Max DI is still an excellent option and one of the few of its kind. It is easy to become accustomed to, and you can quickly navigate its many functions. With the Dual Beam sonar and Down Imaging, it's one of the best options for its size and affordability and gives you strong returns with sharp images. There are some functions we would have like to have seen such as Dual Beam Plus and split-screen images. We also have to contend with the issue of the head control not sitting securely to its mount. With all of this in mind, we feel confident in giving the Fishin’ Buddy Max DI a B rating.